silence. performance. all-in-one. The MasterLiquid Lite 240mm AIO water cooler features the greatest advantage of being silent, as it's optimized for low noise and performance. Cooler Master controls quality and builds on decades on innovation with 100% in-house design and manufacturing. Featuring two 120mm MasterFan Air Balance blades, which propels air further out of your PC keeping it efficiently cool. Along with a low resistance 240mm radiator with a custom design. The kink-resistant tubing and matt-black styling, this original design is attractive to any novice or expert builder looking for an easy setup. Many of Cooler Master's products are known for their easy installation so your build will be stress free. 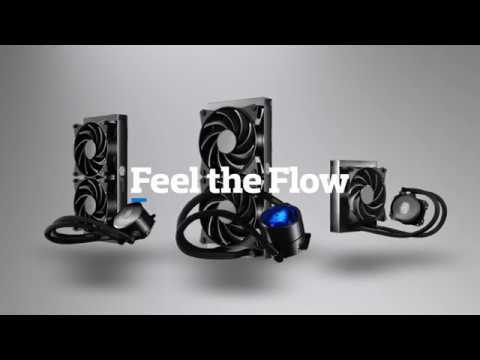 get the quietest liquid cooling One of the greatest advantages of the MasterLiquid Lite 240 and liquid cooling in general is silence. The robust build of MasterLiquid coolers and quality precision copper base, mean less noise and vibration, making Cooler Master's All in One coolers some of the quietest in-class. ULTIMATE COOLING OF THE PROCESSOR This Dual Chamber pump isolates the heated coolant to maximize the results of the cooling of the processor. SUPERB COOLING PERFORMANCE The custom design low resistance radiator allows higher flow rate, heat exchange efficiency and provides an unmatched cooling performance. Cooler Master MasterLiquid Lite 240, All-In-One Hydro CPU Cooler, 2x120mm PWM Fans 240mm Radiator, For Intel/AMD CPUs is rated 3.5 out of 5 by 2.